Ocean front beach cottage with great ocean views and newly completed beach renourishment. Sleeps 10, 3 bedrooms each with King size beds and private bath. One master has a separate seating area with 2 twin beds. Additional sleeping in kids loft with two sleeping areas, two twin size beds in each side of the loft (low ceilings). CCTV in the kids loft - perfect for entertaining the younger set. Very well stocked kitchen with two refrigerators, dishwasher, microwave wet bar. Central heat and air,, 3 CCTVs including, DVD player, WiFi. Separate room with washer and dryer. 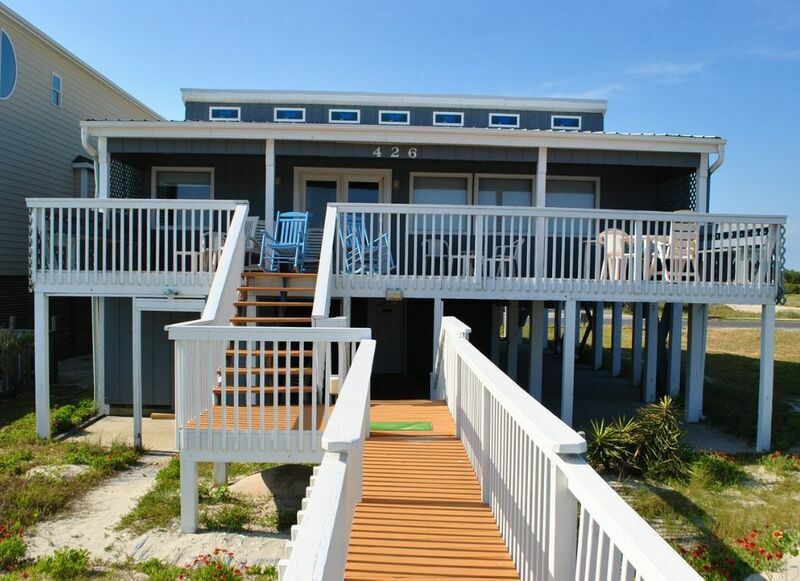 Great outdoor furniture, covered porch, private walkway to the beach, beach toys, gas grill. Pet Friendly with additional non-refundable pet fee. Non-smoking. Great house with king sized beds in all 3 bedrooms and a great kitchen. It is situated at the far east end of the island so it is very secluded. We will be back for sure. We just loved staying in this house. It is towards the end of the island and somewhat more secluded than the rest of the island. There were lots of times when we had the whole beach, in both directions, to ourselves. The description of the property leaves out 1 bed and 1 bathroom. There are actually 4 bathrooms and the upstairs kids loft has 4 beds. The kids loved staying upstairs and we all had plenty of room. The house isnt as fancy as some of the other houses, but you can tell the owners go out of their way to provide everything that you might need to enjoy your beach trip. The house is very welcoming and we really felt at home there. We packed everything under the sun, only to get there and not need half of it. There were tons of kids toys, buckets, sandcastle supplies, beach chairs, boogie boards, kites, beach umbrellas, etc. The kitchen has anything you can think of including an ice cream maker, margarita maker, salad spinner, corn on the cob holders, tons of pots, pans, bowls, coffee cups, and glasses. There were even spices, flour, sugar, cocktail sauce, paper towels, trash bags, etc. The list goes on and on. They also had card games, kids games, and beach games volleyball net, badminton rackets. There is a charcoal and a gas grill outside and an indoor grill as well. They even had dog supplies bowls and a leash. Our dog Emma loved the beach and stood on the deck all day watching the waves. We had the time of our life and will stay here next year.